If you think hi-tech is everywhere in our life nowadays…you’re not wrong at all! Solar backpacks are the latest new thing and they sure make things easier when hiking for hours. As the name tells you, they’re great for charging your gadgets but don’t lose the initial features of hiking backpacks, which is another good thing. Typically, you hike on sunny weather, which is why the solar backpacks are so handy and reliable. You end up doing more than just one thing: you’re not only hiking, you’re also charging your phone as you go. As the batteries don’t take much space, the solar backpacks aren’t that heavy either so you can still carry items you need on the road. There are plenty of options out there and you should get a backpack that had at least 10000mAh battery pack. Some say this is the best weight when hiking as it’s strong enough to charge your iPad for more than once, but it’s not too heavy either. This type of pack works best with a solar panel that is at least 7W. The more wattages you have, the faster goes the charging and the more items you’re able to charge as well. You shouldn’t go for more than 15W though as the size gets bigger (and the price also) and you won’t be able to fit as many as items as intended. Keep in mind that you need the panels to get enough sun so if you stop, make sure you place your backpack flat on the ground. This way, the solar panels would be at a 45-degree angle to the sun, making charging so much easier. Take care of the panels by wiping them from time to time with a nice microfiber cloth. Never forget to check if everything on your backpack is at least water resistant (waterproof would be ideal). You do hike outdoors and you don’t want to stop because of few drops. It wouldn’t hurt either if your solar backpack is dirt and shock resistant, as you want it to handle a beat and a long hiking day in the desert. 1). If you go shopping on a tight budget, you can get a good deal with a solar backpack like the ECEEN Hiking Daypacks with Solar Charger. Even though it’s not the strongest option out there, the backpack manages to give you a charge when on a move. One thing we really like about the backpack it’s the weight and the backpack sure is lightweight and comfortable to wear the whole day. It has made with water and tear resistant Nylon material that doesn’t wear out that easy. 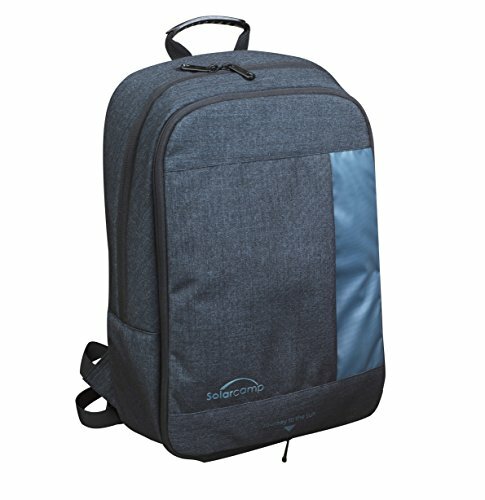 The backpack is also abrasion resistant and comes with many good features. It has plenty of pockets and pouches on sides for better organization of your items. The main pocket fits your laptop and the outer smaller pocket gives easy access to your smaller items. The stress points are reinforced with bar tacking, expanding the backpack’s lifespan. The seams are well made and the backpack sure takes up a beat. The backpack features a 3.5Watts solar panel that is both removable and foldable. It comes also with a 2000mAh battery pack so you’re always able to charge your phone. The solar cells come in a hardened coating that is scratch-resistant. The coating is sewn into a durable PVC fabric that takes the weather challenges. Lightweight, the backpack folds easy and very small, so you may put it in purse or suitcase when in need. Even though it’s not essential, the looks of the backpack also make a nice impression. The backpack looks cool and the colors are nice. The design is good and the straps are easy to adjust and breathable. Easy to use and reliable, the solar backpack is not to miss out when shopping with a penny (so to speak). Nevertheless, as it’s small, lightweight and good enough to charge your phone while hiking, the backpack is a great bang for your buck. 2). 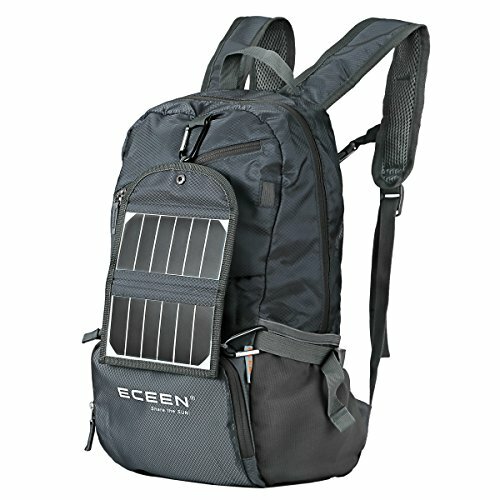 Featuring a 7Watts solar panel, the ECEEN Solar Bag, Solar Charger Backpack with 7 Watts Solar Panel is one dependable backpack that makes your hiking experience nicer every time. The solar backpack includes 7-Watts high efficiency solar cells that are made in our USA. They are protected by a hardened coating that doesn’t scratch and sewn into a durable PVC fabric that is weather resistant also. The 10,000mAh waterproof Li-polymer battery pack is strong enough for your iPhone, external battery packs, MP3 players, Bluetooth speakers and all sorts of gadgets. The 5V USB port lets you charge them easy whenever in need. The backpack is well made and feels lightweight. It easily fits your laptop and has a durability feel to it. it’s made with rip and water resistant fabric, whereas bar tacking is reinforcing the stress points. The zippers are tough and take the intense use and the solar backpack has a good build. 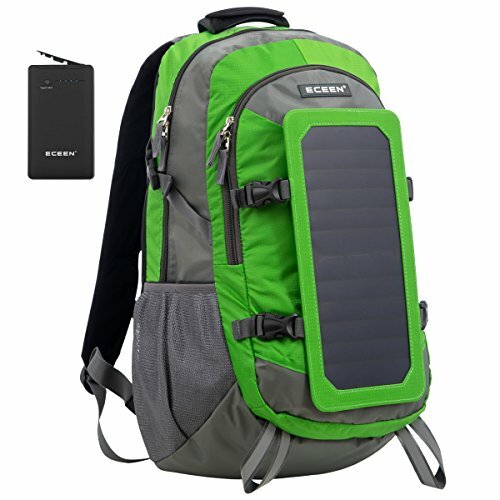 Overall, the solar backpack is a great option whenever you want to hike and stay connected to the other world at the same time. 3). 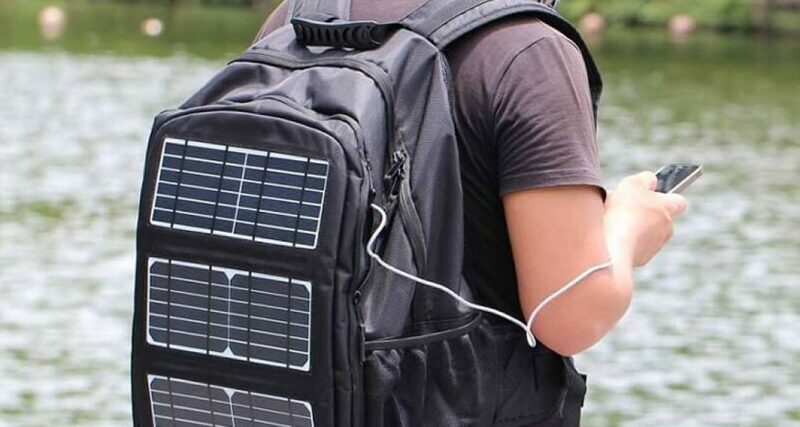 When you want to remain connected at all time, but you’re not necessarily hiking, but rather commuting or running some errands in town, you can totally rely on a solar backpack like the SOLAR CAMP Solar Charging 5V 6W Multi-use Function Backpack. The thing that impresses the most on the backpack it’s the special CIGS (Copper Indium Gallium Sellenide) technology that allows you to bend the thin solar panel to various shapes. This gives versatility and you may apply it to different surfaces. The backpack is lightweight and very comfortable to wear. It’s made with good quality materials and the solar panels are surrounded by materials that take a few splashes, as they are water resistant. The material around the module is pretty breathable also, which is so handy on a rainy day. We really like the versatility of the multi-use solar module that you may use a typical backpack, business bag or as a solar module alone. The backpack has a good build and the shake proof straps are wide, increasing comfort when heavily loaded. The ergonomic design gives you speed on the move and the ventilation system is efficient. Spacious, featuring pockets for power bank as well, the backpack has a sporty to business appearance. It comes with divided compartments for better organization of your items. All in all, for its versatility, nice appearance and good build, the solar backpack is a dependable option whenever in need. 4). 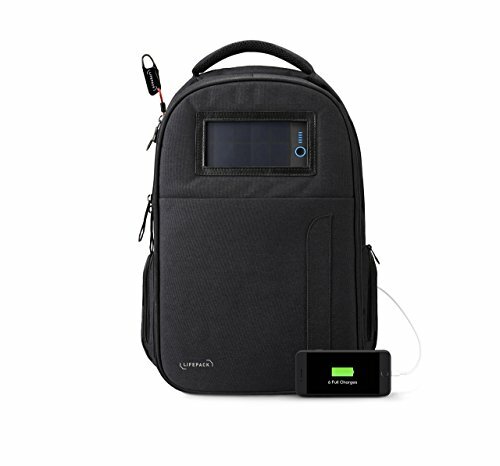 When you want to step up your game a bit, you can put your trust and faith in a backpack like the Lifepack Solar Powered and Anti-Theft Backpack with laptop storage. The backpack comes with a 3-in-1 solar, a power bank, solar bank and even good quality Bluetooth speakers. It also includes a built-in cable lock for more safety. The solar bank on the backpack stores no less than 6 smartphone charges, giving 1 extra charge after 4 hours of sun. The backpack comes with many functional features: built-in rain cover, receipt and paper storage and built-in retractable lock. The Solar bank is a 3-in-1 Powerbank that includes good quality audio/solar regeneration power system that is easy to carry around. The Solarbank presents 4G Solar Technology, reliable and modern. The 3-number combination lock comes with a cable and you may lock all the compartments of the backpack, minimizing risk for unauthorized access. The lock is quite long and you may attach it to something safe, allowing you to enjoy your trip. The backpack is also water resistant and you want to play it safe using the rain cover, stored in the base of the bag. The four hidden compartments let you store the personal items, keeping it all safe no matter where you are. The list of features doesn’t stop here and we need to mention the USB port on the side that is easy to access for on-the go charging of your phone. Let’s not forget the built-in Bluetooth speakers that come with a battery that gives almost 100hours of playback. Easy to travel with, well-made and featuring sturdy zippers, the backpack is made with thick, yet soft material and is very comfortable. Regardless the minor issues, for all the features and reliability on the go, the solar backpack is a safe choice any given day. 5). Let’s get something straight right from the beginning: the Gregory Mountain Products Baltoro 75 Goal Zero Backpack isn’t just a solar backpack, but it’s the solar option of any serious and avid hiker. The backpack is a real power horse that any passionate hiker should have as it comes with so many features and such an amazing build. The list of great things begins with the build-in Goal ZeroNomad 7 Plus solar panel that is integrated into a magnetically secured flip down panel, placed on life. The backpack also comes with Flip 10 recharger in the top zippered pocket and features 10mm insert for a better customizing of the back panel fit. We also notice the 3D interchangeable pre-curved LifeSpan EVA foam harness and hip belt that fit so many types and body sizes. The backpack features a sidekick daypack that is easy to remove and may be used as hanging reservoir sleeve when in need. You don’t have to worry about rainy days thanks to the built-in rain cover. No worries on the safety of your items either as the backpack presents security pocket underneath. The Double Barrel lid design has dual zippered pockets, whereas the top-loading design makes backpack easy to use. The U-zip pane access is reliable and fast. The backpack also comes with sidewinder bottle stash and the girth-hitched multi-straps help with the compression, for better comfort when heavily loaded. Let’s not forget the dual ice axe loops and the upper shock locks that you may use for your ice tool. If you also like trekking, it’s nice to know that the backpack includes a trekking pole attachment. The solar panels are easy to use and removable. The backpack is well build and the list of features is impressive. For all the great features that includes, the solar backpack may be the last backpack you will buy as it’s gonna outlast you.